Elizabeth “Betty” Harriet was born Thursday, November 5, 1931 in Kitchener to Frederick Herbert and Veronica (Erb) Ermel. She was one of ten children; Earl, Jean, Gerald, William, Audrey, Marilyn, Yvonne, Frederick Jr. and Joy. The Ermel children were raised just outside of the city where Betty attended public school and then high school in Kitchener. By 1949 Betty was working for her brother Earl, who housed boarders. One of his tenants happened to be Allan Albert Schwartz. The two were soon introduced and eventually began dating. Betty had stated several times in her youth that she was going to marry the first man she kissed and that she did. The young couple were married on September 15, 1950 at Grace Lutheran Church in Kitchener. They quickly settled into an apartment in Kitchener before returning to Allan's roots in Sullivan Township were they settled on the 7th Concession. Betty and Allan soon began their family welcoming Dianne in 1951, Brenda in 1954 and Mark in 1957. Life on the farm was very busy. In addition to taking care of the kids, preparing meals and tending to chores around the house Betty also helped in the barn. Although not her favourite task, Betty could often be found helping Allan milk the cows. The Schwartz family also grew a variety of fruits and vegetables on the farm. Betty loved gardening and used much of their harvests to feed her growing family. Sadly, in February of 1961 their barn burnt and later that year (December) their house also burnt down. These events forced the Schwartz family to move back to Kitchener for a period of time. Unable to get farming out of their system, the family soon moved back to Sullivan Township, this time to a farm down, and across, the road from their old place on the 8th. They remained there until 1988 when they sold the farm to their son Mark. Betty was a hard worker all of her life. She was also known to be very determined, a little feisty and liked to control much of her path in life. Betty was very kind and gave freely to others, loving to entertain friends and family at her home. She also excelled at sewing, knitting, cooking and baking. Apparently she made the best Dutch Apple pie around often using the fruit from her own trees! In fact, it has been said that Betty's creations in the kitchen were difficult to beat (just ask Allan and the kids). And to top it off, she was extremely thrifty in the kitchen as well. When rest was afforded, Betty liked to listen to records, especially Charlie Pride and Buck Owens to name a few, and play board games. Apparently, she was quite competitive and was never satisfied unless she came out on top! Scrabble was a particular favourite of hers and she and her sister, Marilyn always put their best game forward when they competed against one another. Betty had a fondness for religious programming on TV. And of course, read her Bible regularly. In fact, she loved to read and read a wide variety of books over the years. Allan and Betty remained out in Sullivan until 2014 whereby they moved off their property on the edge of the farm and into Chesley and the Islay House. Although they missed the farm, living in Chesley soon became the norm as they settled in. Here again she enjoyed socializing with others and entertaining when able. Sadly, in recent months Betty's health had begun to decline and she passed away at South Bruce Grey Health Centre, Chesley on Friday, August 10, 2018 in her 87th year. Beloved wife of Allan. 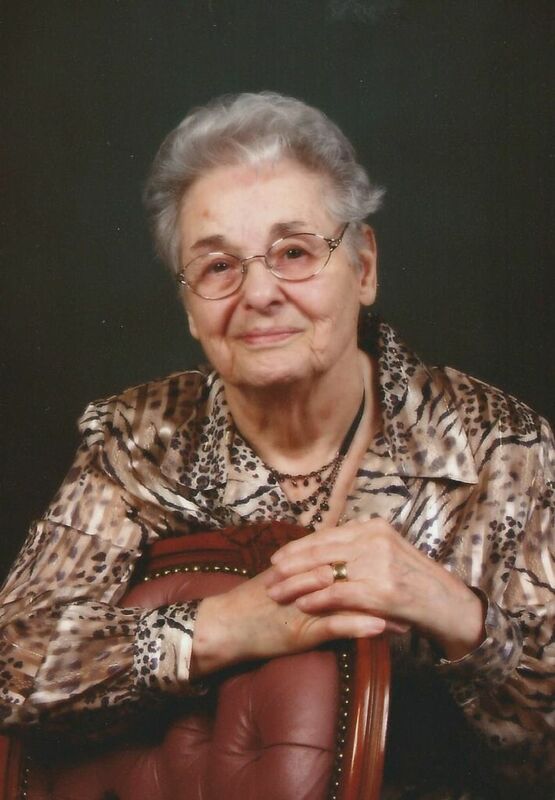 Cherished mother of Dianne (Terry) Godin of Owen Sound, Brenda Robinson of R.R. #5 Owen Sound and Mark (Linda) of Hanover. Betty will be dearly missed by her four grandchildren and fifteen great-grandchildren. Loving sister of Gerald Ermel, Joy Carpenter and Marilyn Luft. Betty was predeceased by her grandson Brodie Schwartz, son-in-law Jim Robinson, three sisters and three brothers. A memorial visitation honouring Betty’s life will be held at Rhody Family Funeral Home, Chesley on Saturday, September 8, 2018 from 2 – 4 p.m.
Memorial donations to the Chesley Hospital Foundation or Heart & Stroke Foundation would be appreciated as expressions of sympathy. Our thoughts & prayers are with you. Our sympathy to you with the passing of your mom, Mark & Linda, & family. Dear Brenda and family, so sorry to hear of your Mom, Grandmother's passing. Our thoughts and prayers are with you. We were so sad to read of your Wife’s/Mom’s passing. She was such a sweet lady. We so enjoyed our visits when we were home last year and the year before. It is never easy to say good bye to a mother so just know you will be in our thoughts and prayers. Allan and family, my deepest sympathy for your loss. This is from my husband as he doesnt do computer. Betty u will be missed by all . Such a sweet lady . My condolences to the family . HERB DAWDY. Betty was a lovely lady , I remember her quite fondly as a great neighbor when I was growing up on my home farm next door. My prayers are with you all. So sorry to hear of your mom's passing! My prayers of LOVE, COMFORT & HOPE to you, Mark & Linda, & all your family ❤️???? I was very sorry to hear of your Mothers death. What a surprise after seeing you just last evening. Thinking of you.